Microsoft has just released the Surface, the first tablet and the first PC it has built in its decades of history, and now the Redmond company is testing a phone with suppliers. Informed sources claim Microsoft is becoming much more like Apple, a company that builds both the software and hardware itself. 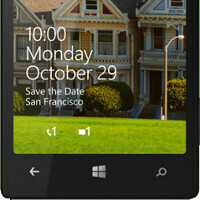 This corroborates earlier rumors about a Microsoft Windows Phone. The supposed device is said to measure more than 4 inches and less than five, making it larger than the iPhone, but smaller than phablets like Samsung’s Galaxy Note II. It is not yet certain, though, whether Microsoft will kick off mass production of the device. For the moment, it is only testing the design. We would not be surprised at all if that phone becomes real some time next year. Chief executive Steve Ballmer last month said that Microsoft will ‘obviously’ do more hardware after the Surface. How would that affect its vendors? We don't know, but we guess Nokia for once will not be very excited about this, after it bet its future solely on Windows Phone in 2011. Please don't mention Apple in this great competition mate. I bet MS will keep some very special features that are yet to be revealed exclusive to this phone. And after looking at Surface RT's hardware excellence I think MS can really make a good quality phone. And gotta say, MS is good at spotting the sweet spot. Beautiful... Very gorgeous design. Much like the surface tablet. I wish it came with micro USB cable and not another 'new and faster and lighter or whatsoever' cable, just to earn more money. The image below is just a concept, an artistic rendering, nothing to do with an actual device. ya.. but if MS can put together a phone just like that .. it will be amazing !! I wish this isn't just a 'concept' dan Nokia have a lot of, and never become real. Good for Linux in long run. Ubuntu is already on the move ... so competition ahead on tablet segment for sure. Question however is ... what happens if M$ fails with all this (they can fail if Nokia coulnd't get their numbers up what's so spl with M$ that they will succeed)? After all it needs big sales numbers to justify these moves. Just patting your own back and being critical of others doesn't help much. the very reason they will make their own hardware! coz they think nokia didnt make WP sales that much! but i think nokia did a very great job making WP's name relevant now! and what tech they could actually do? nokia can do what it want to do... they are innovators... but MS is an innovator too but not as much as nokia...pureview, puremotion HD+ and clearblack display are innovation and revolutionary! next year will be good!! i hope microsoft will make this happen!! hope they'll make surface phone and announce it already!!! Apple with iPad and iPhone google with nexus 4 and 10 microsoft with surface phone and RT/pro BlackBerry(nikolas dont bother comment) with BB10 phone and tablet!! this will be good for us tech folks! they make bada...yeah right! they kill bada!! replace with tizen... which is now nowhere to be found! No need to be so emotional "Pika P", i ain't mad at cha. I can even feel your passion for Nokia with all the "!!!!". Samsung makes other devices other then phones and tabs, like smart TV's and stuff. These machines uses software, so. You stated Samsung doesn't have their own... If Nokia was so good, as you put it, then where are they now? I hope Nokia gets back on their feet, but i feel going the Windows way will not help, jmo. I really hope Nokia success. For all I care, use as many exclamation points as you feel you need. But get your fact straight next time, OK! i know that! tizen is coming 2013 but why no news now! all i know that its already at version 2.0 and PA still didnt post a news for that! i regularly go to tizen.org to see what is happening there! but even that "unpopular" bada outsold WP! even they announce that tizen is coming 2013 there's no news about it! while open webOS even though its uncertain when will a real device coming, there's some news about it! and so is firefox OS, which has the same goal like tizen, they are both HTML5! but im glad that samsung is making an effort but still lacking! i heard some rumors that tizen org is angry at samsung coz they dont support them... but maybe its just rumors or even true coz samsung dont make it buzz! they need buzz to make people and developer interested! of course they need software but only maintain not like they need upgrades like android, iOS, WP, symbian and BlackBerry! im not really talking about general, talking about smartphones made by samsung...correct me if im wrong but samsung smart TV uses google TV OS/linux right?! which is already tweak by themselves! nokia was so good, yes...but they were delayed in the change! i keep on saying this and i'll say this again, they already forecast that symbian was falling because of the rise of iPhone which already offers capacitive touch, symbian foundation has the answer and make a version of symbian to be touch-friendly-the UIQ but they dont listen and still continue the s60 which offers resistive touch and not good for touchscreen...ofcourse people will see that iPhone's easy capacitive touch and slim body is more radiant than what nokia is offering! what happen, coz of the delay, symbian foundation collapse and great symbian engineer was pick up by google to work with android.. fast forward now, android is now the leading OS... and nokia is falling coz of terrible decisions thats why i dont believe they listen to people anymore! nokia belle is a breakthrough of symbian OS! it looks very modern even people now love live wallpaper, there are still people who love to put their faces and gif on the homescreen and what's more amazing is that nokia belle offers 6 different homescreen with different wallpapers on it! but nokia already decided to kill symbian, belle fp2 was the last update, and is the greatest update! it looks like an early JB version! very modern! and even MeeGo! the OS that make tech sites to have love-at-first-sight! all i want is that if nokia could just support symbian till the end, i mean it was symbian who make a nokia device 5year advance than its competition a decade ago... its was a symbian device that make the revolutionary camera phone! atleast they put symbian to low end market! i mean all symbian need is 1GHZ processor and 256RAM right... and that spec is pretty standard to low end android! not the s**tty s40! symbian can do multitasking s40 cant, symbian can run both java and symbian(sis files) apps s40 only runs java and symbian has 100,000 apps on the nokia store while s40 only have 25,000 and what nokia expect? people will still develop java apps? maybe..but still symbian deserve to live! people would love to have a 3D game for low end! not 2D old-style game! and yes jumping to windows phone is not helping! especially that microsoft is rumored to release a surface phone! but it help WP to have a name on mobile news! haha! just dont mind my exclamation points! :) and hey, i have my fact right! The bezel on this phone looks like an iPhone 4 antenna wannabe.